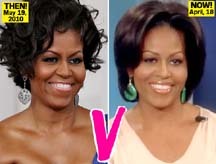 When Michelle appeared looking extra-youthful on The View on April 18, HollywoodLife.com consulted top plastic surgeons and dermatologists for their opinion. 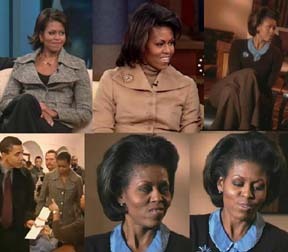 NY-based plastic surgeon Dr. Steven Fallek thinks there may have been minor amounts of Botox used on Michelle. “She may have had a little Botox to the forehead and brow area for a small lift,” he said. ”No surgery suspected. On a still photo where you can’t see movement, the overly raised or arched or ‘Dr. Spock’ eyebrows are the usual give away.” NY-based dermatologist Dr. Katz agreed, saying, “It looks like her eyebrows are quite highly arched and that’s usually a tip off that someone has had Botox.” Dr. Adam D. Schaffner of Weill Cornell Medical College also thinks Michelle is using Botox. ”Mrs. Obama may have had Botox injected in the area around her eyes, between her eyebrows, as well as in her forehead, to soften the appearance of some of the wrinkles in these areas,” he explained. She definitely has had skin lightening and plastic surgery. If I had to guess, and I am no expert, she looks like she has had a nose job, her lips taken in, and some type of jaw reconstruction. Look at those face parts on her before and after pictures. 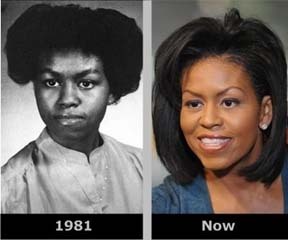 And to back this up further, here is a picture of Michelle Obama 29 years ago to show that she had the same nose shape. She may have had Botox done before, but judging from the two pictures that are 29 years apart.